Since Google released the ability to customize the search preferences a hundred years ago, the only option was to save those preferences to the specific computer/browser you set the preference on. If you used multiple browsers, different computers or devices, you had to set those preferences on each one. That has changed, Google announced on Google+ and Google Web Search Help forums that you can now save your search preferences to your Google account. To do so, go to google.com/preferences and set your preferences and click on the save button. From now on, no matter what computer you use, as long as you are logged in, you will get the same preferences. I should note that Google mobile search settings are different and you need to save those preferences differently when you are on a mobile device. 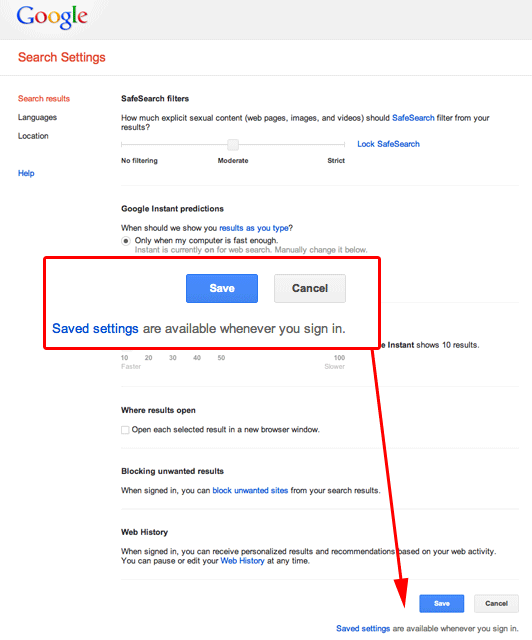 To get the same search settings on any mobile device, save your search settings to your Google Account. Since people frequently have different settings on mobile and computer, such as the number of search results per page, your search settings on mobile devices are separate from your search settings on desktop computers. Currently, the SafeSearch filter and language preference settings can be saved and synced on your desktop computer and mobile device via your Google Account. Finally, if you are not logged into Google, Google will only save those search preferences to the browser you are using. And only if that browser accepts cookies.